The ACON Air 4.6 trampoline promises families a trampoline that will last for many years, thanks to the fact that it is made heavier duty materials than most other trampolines on the market. ACON Air is a company in Finland and they claim that you will never have to cover it during the winter and never have to worry about any issues with it. We believe they made this trampoline to survive the weather conditions in Finland and therefore it should be more than fine in other parts of the world. This means if you and your family want to bounce your way to good health and fun, then ACON may be exactly what you have been looking for. Read our review to find out more. 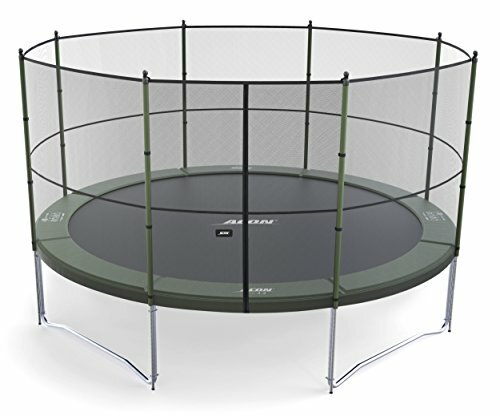 The ACON Air 4.6 trampoline is a 15ft round trampoline that has a premium enclosure. It comes with a 5-year warranty to reduce concerns if a new owner does encounter any problems with the trampoline. There is no single jumper weight restriction on this trampoline, but there is a total maximum weight limit of 800 pounds. This is the highest weight capacity of any trampoline we’ve reviewed which is a huge plus for adults who also want to jump on it. This means it can be used by both adults and children of any size. It also means that you can jump and play together as a family without worry. This trampoline is heavy at nearly 300 pounds. This is due to the fact that the framework is made of heavy-duty 110 8.5 galvanized steel. The steel pipes are a full two inches in diameter and .08 inches thick. The trampoline mat is built to be strong as well. It has been sewn six times, where normal trampolines are only stitched across three or four times. It is made of polypropylene and it is UV treated. The springs are durable and rust resistant. They are covered by a thicker pad than all other trampolines available to ensure your kids are safe while bouncing. The safety net is included with your purchase along with the spring hook to make assembly easier for you. The safety net features a door on it that closes up when people are on the trampoline. This makes it impossible for someone to fall off, no matter how rough they may be playing. As you read through reviews from other people, you will notice that they consistently use words like stability and quality. The biggest issue that people have with it is that the enclosure is a little confusing to put together, but most agree that once the net is securely in place, kids and adults can rebound off it and it does not budge. The only way that you could perhaps make it safer is if you by tie downs or an anchoring system. Those will have to be purchased separately.